Raise a glass to freedom! 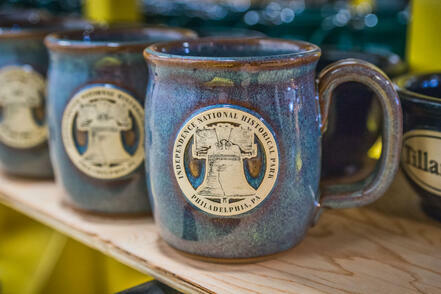 The United States of America is celebrating its 242nd birthday this coming week, and Sunset Hill Stoneware is ready to join the party at plenty of colonial national parks with its mugs and steins as we have for years now. The United States of America famously started out as 13 British colonies stretching across the east coast of the continent. The colonies existed for over 100 years before the Revolutionary War, but everything changed when the British levied universally disliked taxes against the colonists in order to pay for the French and Indian War. Threats to their civil liberties and system of self-government soon followed. 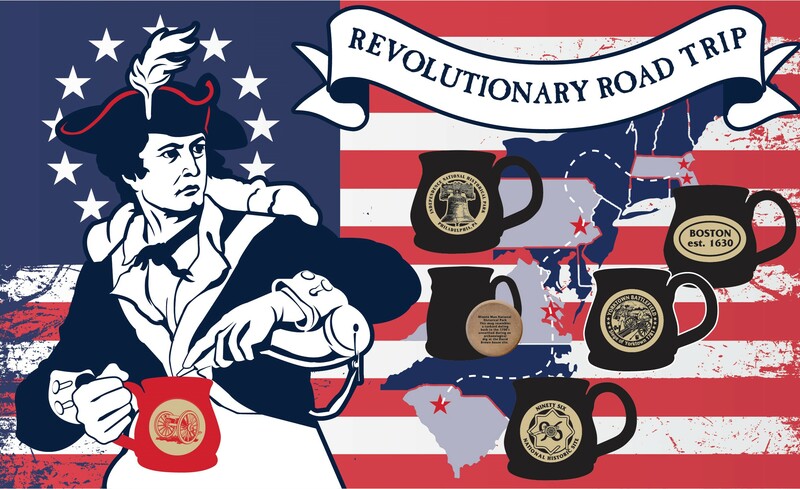 Here are five National Historical Parks where you can find pieces of America's Revolutionary history, plus some handmade stoneware mugs to commemorate your visit. See the full map here. Several major events leading to the Revolutionary War took place in Boston. It was here that, fed up with restrictions on their freedom and a series of new taxes on goods like tea, sugar, paper and glass from the British, the colonists first began expressing discontent. The Boston Massacre, wherein the British opened fire on rioting citizens, resulted in five deaths in 1770. 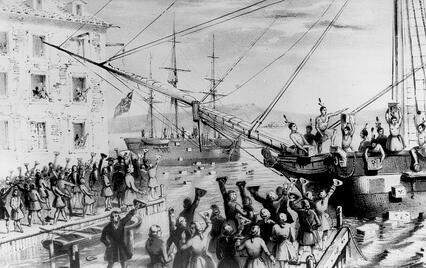 Three years later, Bostonians hurled about 90,000 lbs of British tea into their harbor during the Boston Tea Party in response to new taxes on the leaves. Most of the sites within the park coincide with the Freedom Trail, including the Paul Revere House, the Bunker Hill Monument, Old North Church, Old State House and more. All of these buildings marked significant points in the earliest chapters of the war. While most of the battles that occurred here weren't the biggest or most decisive, they proved the colonists were a force to be reckoned with for the British and further escalated the conflict. Visitors can see reenactments of the Boston Massacre, plus walk in the steps of Paul Revere's famous midnight ride while thinking about how these actions led to the United States becoming its own nation. 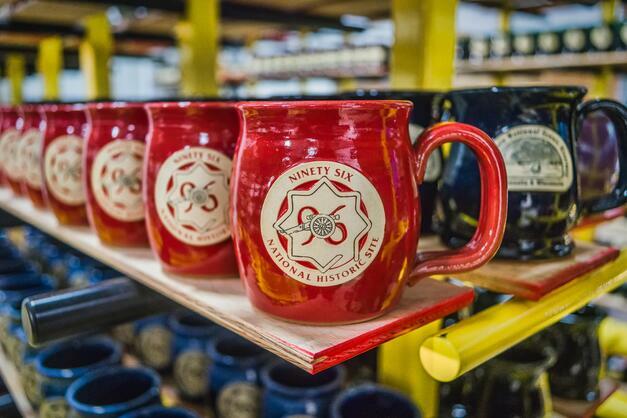 You can also pick up a Sunset Hill Stoneware mug in Sandstone or Sunfire Red with a medallion unique to the park and take a piece of your journey on the Freedom Trail home with you. The shot heard around the world was fired near this spot in Concord, Massachusetts in 1776. The fighting first broke out in Lexington, but this was where American militiamen—known as minutemen—first organized themselves to defend the town of Concord from approaching British soldiers. The small battle in Lexington forced the British infantrymen to move to Concord, where they faced another uprising from local militias. In the end, the British underestimated the military strength of the colonists and were forced to retreat to Boston. Today, the park's landscape has been restored to what it looked like during Colonial times, complete with restored homes and a tavern with living history programs. 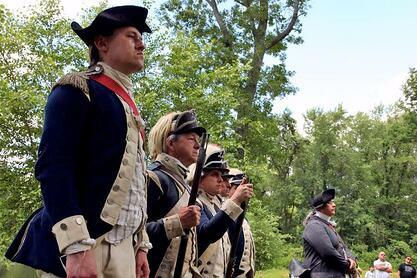 You can also follow the winding Battle Road Trail, a five-mile path through the woods and fields of Concord that follows the route of the fighting between the British and the minutemen. The trail passes the original site of the main battlefield, the Old North Bridge where colonial commanders ordered their minutemen to fire back at the British and the spot where Paul Revere was captured at the end of his famous midnight ride. Although the site at Minute Man National Historical Park only marks the beginning of a seven-year struggle for American independence, the British retreated this time. This conflict was no longer about a group of disorganized rebels causing chaos in Massachusetts—it was about a united group of people fighting to be an independent nation. Sunset Hill Stoneware can be found at Minute Man National Historical Park's North Bridge Visitor Center, near the Old North Bridge; or the Minute Man Visitor Center near the east entrance. The mugs at this park are designed to look like a tankard from back during the time of these first battles, so you'll be able to feel what it may have felt like at this first flash point in the Revolution with every cup of coffee or beer. A staggering amount of important turning points in America's early history took place within this single square mile of Philadelphia. Independence Hall, a UNESCO World Heritage Site located within the park, is famously known as the place where the Declaration of Independence was adopted on July 4, 1776 and the U.S. Constitution was ratified 12 years later in 1788. Also found within the park are City Tavern, a popular meeting place for America's founders, and the Liberty Bell Center, where the cracked bell stands on display for visitors from all over the world. While the Declaration of Independence itself is located in the U.S. Capitol, visitors to the park can see the archaeological remnants of the President's House, the First and Second Banks of the United States and more. Every corner of these six city blocks is bursting at the seams with America's history. Visitors to the site may also find Sunset Hill Stoneware's Java Taster emblazoned with the Liberty Bell in our Stormy Blue glaze. Freedom rings in this mug, even if the Liberty Bell no longer can. A host of other mug and stein styles are also available to take home, including the Speakeasy and Dale Barrel in a variety of glaze colors. Located in the town of Ninety Six in western South Carolina, this national historic site marks what used to be a Loyalist stronghold during the Revolution. The British considered the spot in the backwoods of South Carolina a strategic location and further fortified it as the war progressed, including with a star fort. While the Continental Army laid siege to the fort and town of Ninety Six in May of 1781, they weren't successful and the fort remained under British control until after the war. Ninety Six National Historic Site shows that not everyone in the Colonies was interested in an independent nation during the Revolutionary War. 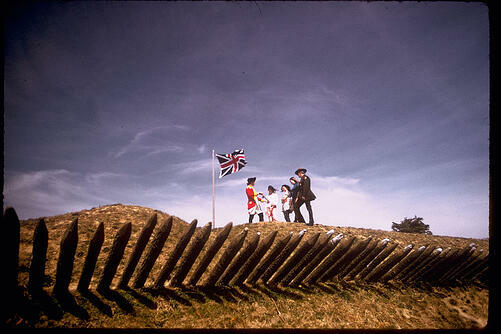 By some estimations, about 20 percent of the colonists were loyal to the crown, while most of them were on the fence. Many of the loyalists were older and richer than the rest of the population. By the time the Americans gained independence, they either returned to England or went to Canada, which was a British colony at the time. Their exit changed America's identity for years to come. Anyone who makes the trip to the town of Ninety Six can expect to find a red Java Taster or Straight Shot in Royale Frost waiting for them at the site's visitor center. The medallion takes on the shape of the site's star fort in the interior and features a cannon that was commonly used by both sides during the war, highlighting the park's military history. The Revolutionary War came to its decisive conclusion at this battlefield in Yorktown, Virginia in 1781. It was here that American forces routed the British and cut them off at sea with the aide of their French allies. Fittingly, the park also contains the site of the Jamestowne settlement, so the beginning and end of America's colonial past is captured in one place. Located on the shores of the York River, Colonial National Historical Park showcases a network of important sites and monuments from the last major battle of the war, including a series of earthen shelters and several houses where the terms of surrender were signed. There's a reason we refer to the Battle of Yorktown and its aftermath as "the world turned upside down." Throughout the war and even up to that point, the Americans were thought to be outmatched by the might of the British army. Still, they managed to prevail through bitter odds and earned support from France and high-profile generals from abroad like Baron Von Steuben and Casimir Pulaski to help them gain independence. Visitors looking for Sunset Hill Stoneware mugs to add to their collection can visit the Yorktown Battlefield Visitor Center near the entrance to the park. Potbelly mugs in Sunfire Red and Renaissance Voyager mugs in a Natural Clear glaze will be up for grabs, with the medallion on the front depicting the famous battle in vivid detail.